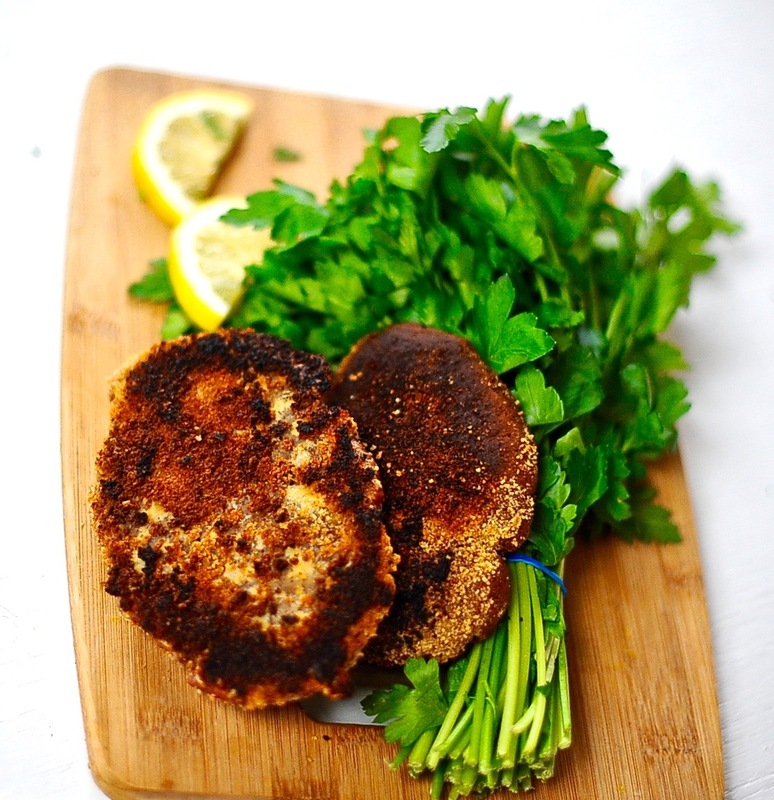 These vegan seitan Schnitzel are crisp on the outside and succulent on the inside. 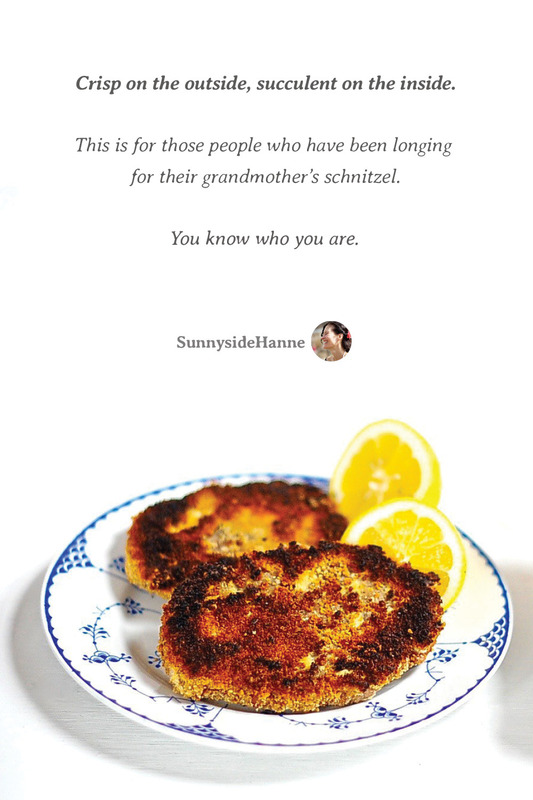 This is for those people who have been longing for their grandmother’s schnitzel. You know who you are. Early one shabbat morning we left the kids with my mother-in-law and her husband Big White Noam (so named by our son to differentiate him from another Noam). My daughter was the namer of inanimate objects like computers (Lisa) and our son renamed relatives, like my uncle formerly known as Niels, who is now called Big Orange. We set off to a nearby town to breakfast with Hanaan’s yemenite buddy Itamar and his beautiful bride (so named because I have forgotten her name). They sat us down in their sun streaked living room and set before us myriad little dishes: savory salads, salty pickles, unctuous bean purees, crispy phyllo packets with melting salty cheese, tomatoes that had yielded their form and surrendered to sweetness in a puddle of golden green oil. Our hosts encouraged us by placing a spoonful of this and a scoopful of that on our plates. An hour later, when we were well and truly full, our hosts, to our horror, announced breakfast was ready and led us to their little kitchen table. Hanaan and I avoided eye contact at this point. There was nothing to do but man up and eat the breakfast set before us. Eat we did, a grande yemenite breakfast, with the heavy butter laden slow baked Jachnun bread as the center piece. As the meal drew to a close and our belts were stretched to the breaking point out host announced that as the guest of honor I needed to close the meal by eating the last of the boiled eggs. Never a shirker I did my duty. On the drive home we congratulated ourselves on having done justice to the hospitality of our friends and were relieved to know that not another bite of food need pass our lips that day. 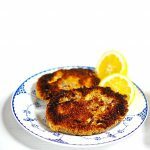 The first thing we saw when we entered my mother-in-law’s house was the dining room table set for lunch and covered, and I mean covered, in a plethora of dishes both hot and cold, the crowning glory being Big White Noam’s sabbath specialty fried schnitzel. Yes we could have demurred but one look at Big White Noam’s face and we knew that saying no would break a tiny chip out of his heart. He was a big man, with a big heart, and what is one tiny chip you ask? It is nothing unless you are the one doing the breaking. Crisp on the outside, succulent on the inside. 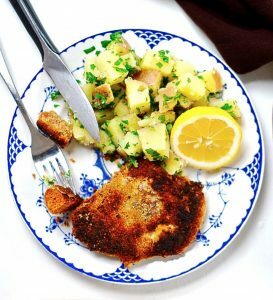 This is for those people who have been longing for their grandmother's schnitzel. You know who you are. Roll up your sleeves and knead the dough with your hands for 2-3 minutes to activate the gluten. Break the dough into 6-7 pieces. Roll each into a ball and with a rolling pin flatten them into schnitzel-y shapes. Lightly grease a baking pan and place the rolled out schnitzel pieces on it. Bake in the center of the oven for 20 minutes and remove from oven. I use shallow bowls or pie pans for the dipping process. Place milk, flour, aquafaba and bread crumbs in separate shallow bowls or pie pans. Dip each piece of schnitzel dough first in milk (on both sides), then flour (both sides), then aquafaba (both sides), then bread crumbs (on both sides). 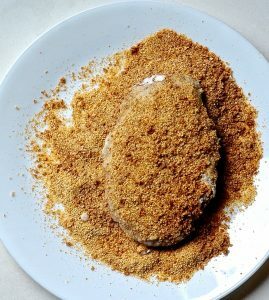 I really try to press the bread crumbs on firmly because I want a really crunchy final product. 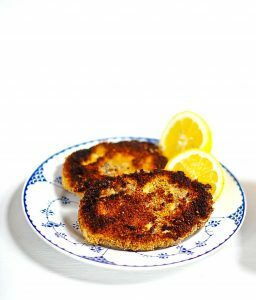 Heat up your oil in a wide pan and fry the schnitzels until golden brown and crispyon each side. 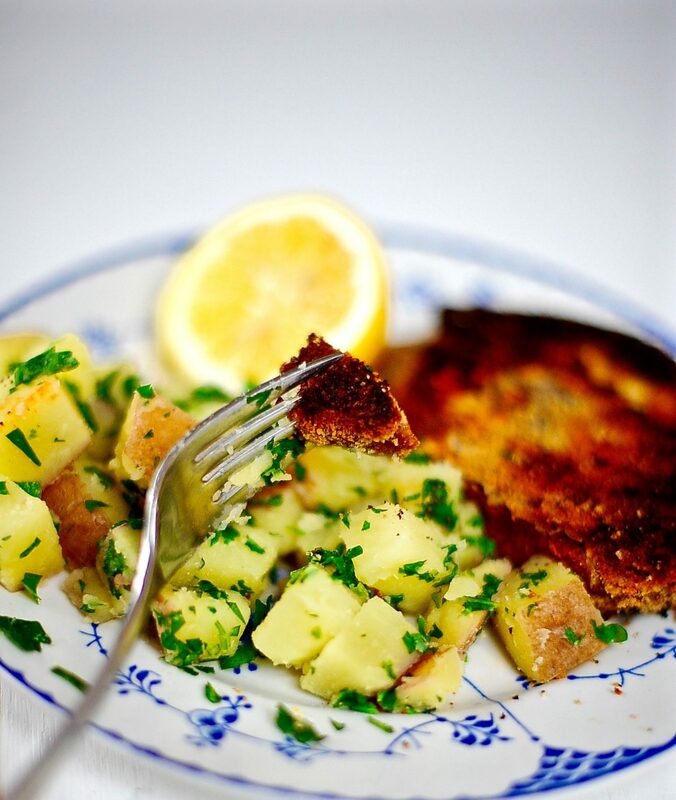 Remove from pan and serve with a wedge of lemon. Are these the dishes from Toppen? They look great under your food! Yes they are. I don’t use then in everyday life. They are so pretty. The first version of that dinnerware pattern – “Blue Fluted” – came into being in 1775. It adorned the first porcelain set made by Royal Copenhagen, which still produces updated – and very popular – iterations of it. The pieces are painted and glazed by hand. Vintage and newer versions are all highly collectible. A true classic, worthy of your culinary artistry. These dishes will be passed down as a set to one of our 3 children. Royal Copenhagen.. Such a romantic name. More romantic than Rosenthal which is another type of china BH had. Every posting gets better and better. Like a lullaby that grew into a muisical that’s becoming a symphony. Beautiful, rich and interesting too. Bravo Hanne!!!! Alison, thank you, knowing you are in my corner cheering me on is a wonderful anchor to my life. 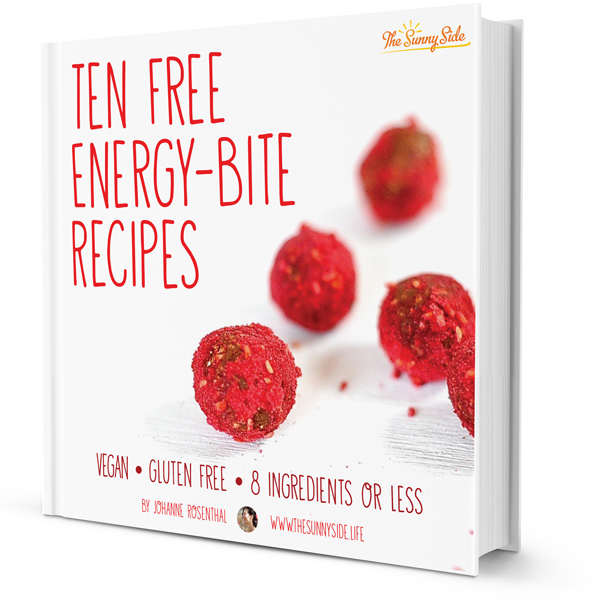 I gotta say – I’ve always avoided vital wheat gluten/seitan but this is definitely a recipe I want to try! Beautiful pics as well! Thank you. It is lovely to have in the “rotation”. I bread and fry up a couple for my hubby and I save a few (un-breaded) and cut them up and top my salad with them. I vividly remember both the Jachnun you brought back to Aylam and me, but also your vibrant hilarious retelling of the event while we laughed with oil smeared faces, small hands clutching the bread as if it was treasure. Luckily you come from a long line of good eaters. Man you loved the jachnun, you also have a thing for malauach. I see a Yemenite thread running through your taste buds. I vote for vegan malawach recipient. I love the stories you weave around your tasty looking creations. Thank you. 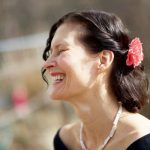 Karen, thank you I appreciate you taking the time to visit my blog. Hello,There is no need to whip it. Just plain old aquafaba. Bon appétit!